You can’t go to Wisconsin Dells and not hit up a waterpark. So of course we had to finally hit up America’s Largest Waterpark while we were there! The Man had been there when he was a little kid, but with all the advancements to fun since we were kids, I highly doubt that even counts! 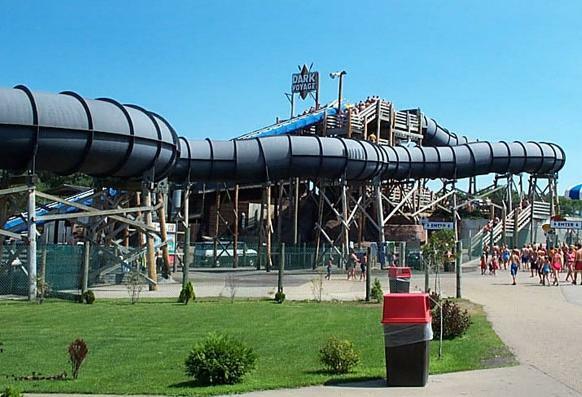 Noah’s Ark is America’s largest water park and features 51 water rides, 2 wave pools and 2 endless rivers. For the little ones, there are 4 water play areas for them to play in and enjoy! It sounds like a ton of fun and adventure, but we made our first mistake when we arrived. We got there around 2pm, not realizing that they closed for the day at 6pm. So learn by our mistake and plan to go early, they open at 10am. Since we arrived pretty late in the day, the teens went off on their own while The Man and I took our boys on some rides. The first ride we hit was Dark Voyage and the wait in line was about 30 minutes. It was well worth it though, because it was quite intense looping through the dark tunnel on a raft for 4. The website suggests hitting the big rides early morning or late in the day when the park isn’t so crowded because the lines will be shorter. Next up, we hit Flash Flood, a roller coaster type water ride that sends a huge wave over the boat/coaster and everyone standing on the bridge to watch. It’s an amazingly fun rush and we all enjoyed this ride! Since we didn’t have a whole lot of time, our next stop was Paradise Lagoon so that the kids could have some fun on some slides without a long wait. They also wanted to check out the cable drops! The boys had so much fun in this area and Lil Man especially enjoyed the cable drops. The pool is 11 feet deep, so make sure your kids are strong swimmers before letting them go. Seriously people, we watched the life guards rescue a kid from drowning! I do have to say, they were quite quick and efficient though and the parents of that kid really should have thanked them! After the Paradise Lagoon, we hit up the wave pool. I went in for a little bit, then took the opportunity for a photo opp since all of our stuff was near the wave pool. Unfortunately, the wave pool shots are the only photos I took at Noah’s Ark, but at least the memories will last! Next time we go to the Dells, I’m taking a waterproof camera along! 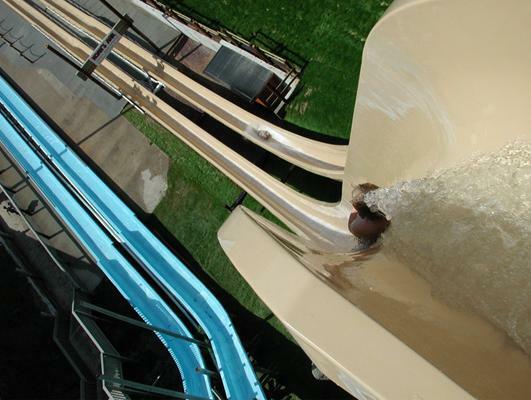 After the wave pool, we hit up one of the smaller slides, then the lazy river. 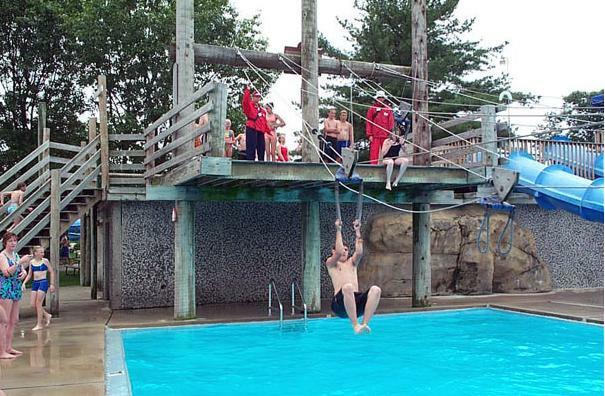 Ah, no waterpark is quite complete without one of those! This lazy river is unlike any other though because it’s nice and long! Since the lazy river was, well… a little lazy, the kids wanted to do The Point of No Return! So we headed over there, waited at the end and watched for them to come down. This ride will give you a big ole wedgie, so watch out, but the kids loved it! It’s definitely a ride for thrill seekers and some guy even got offered $100 by his friends to go down it! So when the kids got off, the guys asked them how it was and Lil Man said “That was awesome!” I wonder if that guy ever went on that ride afterward and made $100! Aside from the great fun at Noah’s Ark, there are places that you can grab a bite to eat, a refreshing drink and even a gift shop! Make sure to bring some towels along though, because they aren’t provided in the park. However, they do have towels available for purchase in their gift shop. You can connect with Noah’s Ark on Facebook, @NoahsArkWaterpk on Twitter and through their YouTube channel!